Taking advantage of your newsletter is a wonderful way to kick off your book launch as well as to continue to promote it and drive long term sales. You can get many examples of the following emails from our cookbook newsletter promotion templates article. 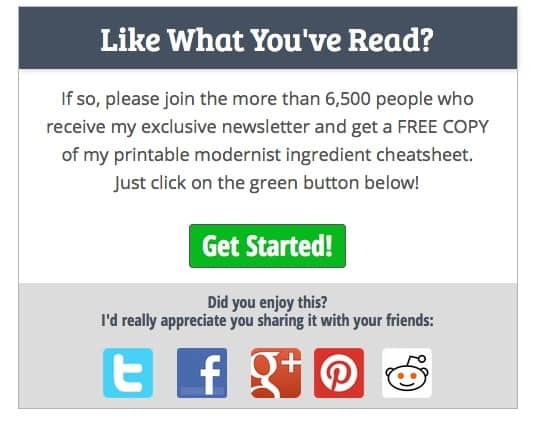 While you are writing your book you should be focusing on driving sign ups to your newsletter. Both from general blog readers as well as from people specifically interested in your book. There are many ways to capture these email addresses. Placing signup forms throughout your site allows you to consistently add people to your newsletter. These links can either be inline or at the bottom of every post. If you are just getting started writing a newsletter we highly recommend reading The Beginners Guide to Starting a Newsletter by Pat from Smart Passive Income. You can create giveaways to draw in newsletter signups. This is an especially effective way to draw in subscribers who are interested in your new book. You can offer a prize to a randomly picked subscriber to your newsletter. 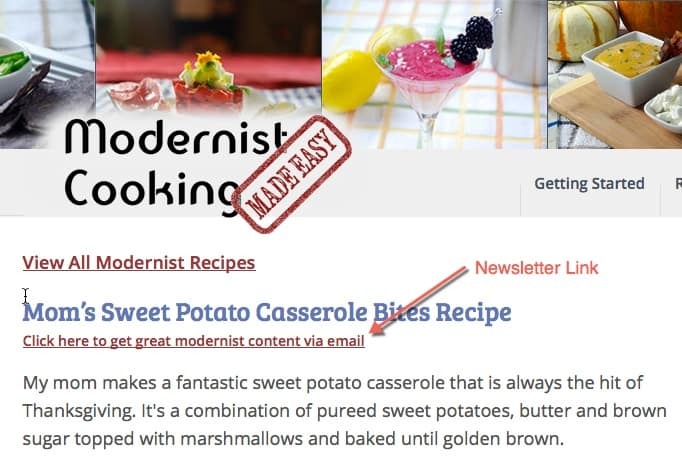 Here was our giveaway page before we launched Modernist Cooking Made Easy: Party Foods. You can offer just about anything as a prize. A free copy of your upcoming book is great. If you have multiple books you can offer a combo pack of them. You can also give away a piece of equipment or fancy ingredient that your readers would enjoy. Leading up to and during your book launch there are many ways to take advantage of your newsletter list. Several weeks, or even a few months, ahead of time you can tease that you have a new book coming out. From hinting at your upcoming book, to posting covers or sample recipes you can prime interest for you cookbook, leading to higher sales and better promotion when it comes out. When you are teasing your upcoming cookbook you can also solicit your readers for people interested in reviewing your book on Amazon in exchange for a free copy. This is a great way to get people that are biased in your favor to leave reviews on Amazon. During the beginning of your book launch, your newsletter can be used to great effect to drive initial purchases. These purchases will kick up your Amazon Sales Rank, leading to much better promotion. The regular readers of your newsletter are also much more likely to purchase your book when there are few Amazon reviews available, which is often the case early on in your launch. Not everyone will purchase your book during the initial launch. Many people will hold off until they learn more about it, read reviews on it, and develop more of an understanding about what it covers. This means that continuing to market your cookbook in your newsletter will result in additional sales. Providing free content, either in the newsletter alone or on your blog, as well as testimonials, links to articles about your book, and other great content will push many of your readers over the edge and cause them to purchase your cookbook.